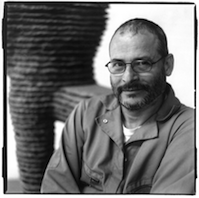 Boaz Vaadia is the internationally known sculptor whose timeless, evocative stone figures now inhabit museums, cultural sites, art galleries, and private collections. As major installations at prime buildings, parks, and homes around the world, they set a tone of peace and serenity. Born and raised in Israel, Vaadia moved to New York City in 1975 thanks to a grant he received from the American-Israel Cultural Foundation. Vaadia established his studio in SoHo where roads were being torn up and buildings were being torn down. In the chaos of New York City, he discovered supplies from the earth. Slate and bluestone, ubiquitous materials of the city, are sedimentary rocks from glacial periods, millions of years old. Starting in 1985, generic representations of man and woman emerged from Vaadia’s earlier abstract, monumental effigies. Though generalized in form, there is some individuality in each figure, the artist’s intention being to represent the essence of a specific person. “I love people. Each person is unique, as is the work of an artist. It is important that we, as artists, identify our own uniqueness, just as every individual needs to identify his/her own individuality.” This individuality resides in centeredness, not in superficial attributes. It is that which unites us as human beings. Vaadia hand carves slices of slate and bluestone, shaping them to be layers in a kind of topographical map. He stacks the horizontal slabs until the graded silhouette of a person, animal or group emerges. He views the geological layering of the stone as a natural model for his own sculptural process. It seems a logical metaphor for our human layering of experience and memory.